Ace Attorney remains one of my favorite franchises of all time, and I have loved the opportunity to play through the trilogy again on Switch. Though it lags a little in the middle with some less-than-stellar cases in the second game, the Ace Attorney Trilogy is still an incredible story with wonderful characters, memorable plots, and satisfying mysteries to solve. I am truly pleased with the quality of Phoenix Wright: Ace Attorney Trilogy, from its gameplay mechanics to its remastered visuals, to its sound effects and soundtrack. This iteration is easily the best the franchise has received, and even if you recently played the DS or WiiWare ports of the games, I strongly recommend that you pick this up as it will offer a whole different experience for these classic three titles. 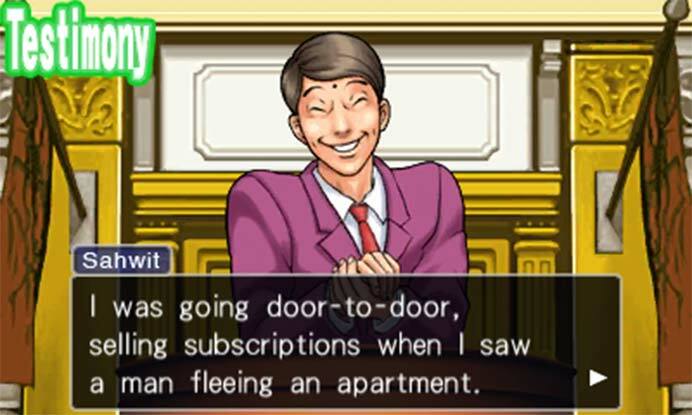 Phoenix Wright: Ace Attorney is a win in my books. The story was fun, the characters amusing and it was challenging. 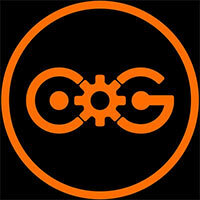 This game doesn’t just give you the answers or make it easy to win and this will keep you coming back for more. Fans of anime styled games, murder mysteries and puzzles should definitely get a kick out of this one and three games in one makes it a bang for your buck. There is, of course, the off-chance that the trilogy might be someone's first exposure to the life and times of Phoenix Wright, or at least their first exposure in a great many years, and it's as refined a jumping-off point for that as can be expected. For anyone for whom this is their third, four, or fifth time around, there's nothing new to discover, aside from the convenience of having all three games in one handy digital package. If you’ve never played Phoenix Wright, or if you’ve only played one or two of the original trilogy, this collection is a great way to finally rectify that. However, if you’ve picked them up for the DS, or the Wii, or iOS (or Windows for our Japanese friends), you may want to pass unless you're looking for a convenient way to experience the games. With no new features aside from the rudimentary 3D, this collection is meant to satisfy those who haven’t come to love the unique and colorful world of Phoenix Wright. Phoenix Wright: Ace Attorney Trilogy is an excellent package, delivering hours and hours of entertaining and quirky interactive novel gameplay. ...As an isolated product, however, this is a wonderful addition to the eShop; surreal, funny and huge value, it's definitely Guilty of being an excellent download. 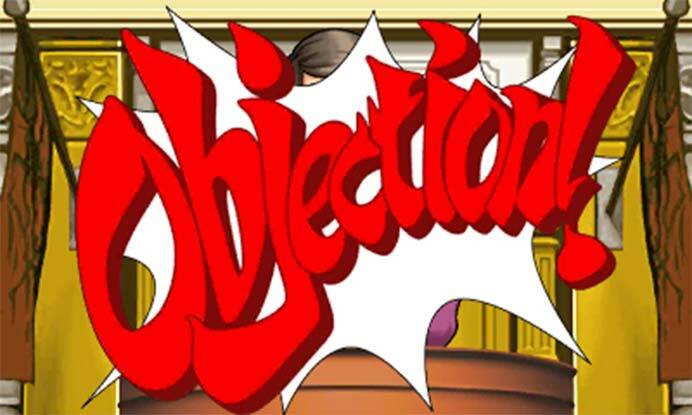 Streamlined trials notwithstanding, Phoenix Wright: Ace Attorney Trilogy is a fantastic way to live or re-live the best Phoenix Wright games in the series. The captivating stories and kooky cast of characters are completely intact, all with a dazzling new coat of 3D paint that makes them look better than ever. Those who have never played the games before will have no objection from me should they decide to proceed down this line of questioning. I would have loved to see the original Ace Attorney games receive a more thorough makeover, but, realistically speaking, this Trilogy is the best we're going to get. That's okay, though, because Phoenix Wright's strength is in its writing, which has certainly held up over the past decade-or-so. If you've never tried your hand at Ace Attorney's brand of interactive crime fiction, this handy collection provides everything you need to become a die-hard fan of Capcom's spiky-haired lawyer. 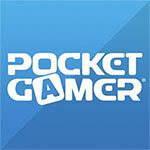 As a result the games are consistently good, but playing them back to back to back would likely lead to monotony. These games are better played with some time left between them, so they can each be enjoyed fully. That small bit of advice aside, it a great collection for anyone who missed the originals or series fans looking to replay the early games. 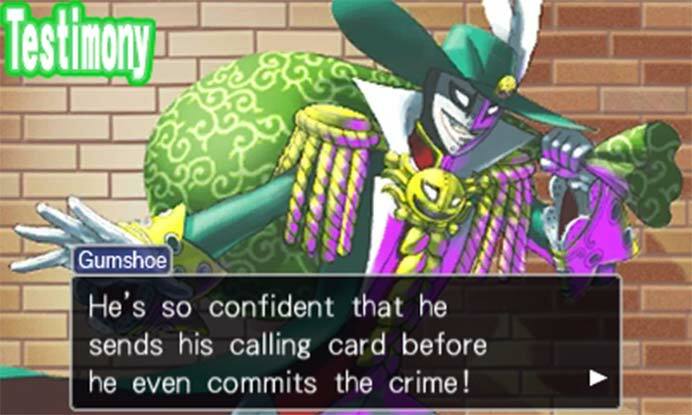 The Ace Attorney games are some of the most charming, hilarious and engaging adventures on the market, and this new 3DS version makes them better than ever before. The port job isn’t entirely perfect, and the lack of a remastered soundtrack is a letdown, but two of the three games in this package are among the best point and clicks ever made, so a bit of uneven quality isn’t the end of the world. This is a good, but not perfect collection of three incredible graphic adventures. It's got slightly washed out graphics and low-fi audio, but the sped up text speed and widescreen backdrops makes this is a recommended purchase for AA fans and newbies alike. Ace Attorney: Phoenix Wright Trilogy puede que no nos haya llegado en las mejores condiciones posibles, pero si hay algo que nos ha quedado claro rejugando a esta fantástica trilogía, es que sigue manteniendo un nivel altísimo, con personajes inolvidables, una historia que atrapa de principio a fin (os llevará unas 60 horas completar los tres juegos) y unos juicios tan intensos como emocionantes. Divertidísimos diálogos. Personajes muy carismáticos. Tres juegazos juntos. Atractivo efecto 3D. Muy recomendable si estáis versados en el inglés, especialmente para los que no hayáis jugado aún a esta excelente trilogía. La remasterización cumple con mejoras de resolución y un atractivo efecto 3D. Lástima lo del idioma. 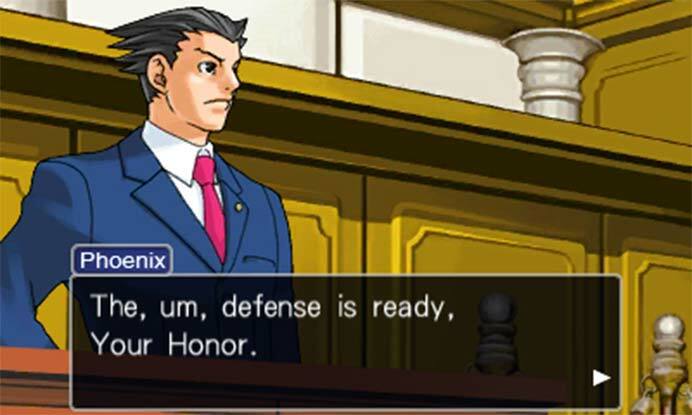 Capcom ha trasladado a Nintendo 3DS su trilogía de aventuras conversacionales Phoenix Wright que tan buenos ratos nos hizo pasar en DS a través de una trilogía digital que únicamente podemos obtener a través de eShop. Sus virtudes siguen intactas, aunque el hecho de estar totalmente en inglés puede restar algo de atractivo a aquellos usuarios que no dominan el idioma. Der zweite Teil - Justice for All - fiel in Sachen Handlung etwas ab, schwang sich zum Ende hin aber doch noch in beachtliche erzählerische Höhen auf, als man es schon gar nicht mehr erwartete. Trials and Tribulations war dann der vorläufige Höhepunkt einer Reihe, die es sich auf angenehmste Art in ihrer Nische passgenau bequem gemacht hatte. Avouez que cela limite considérablement le nombre de joueurs pouvant réellement tirer parti de ce super bonus. Autant dire qu'on attendait davantage de cette version 3DS qui ne comporte rien de suffisamment croustillant pour inciter les fans à replonger dans la frénésie des procès pour défendre des causes qu'ils connaissent déjà. Joliment ravalée, cette trilogie permet de découvrir un style de jeu d'aventure exquis, aux histoires délicieusement abracadabrantesques, croisement improbable entre Perry Mason et Street Fighter, où les plaidoiries se muent en duels à mort face à des procureurs aux personnalités marquantes. 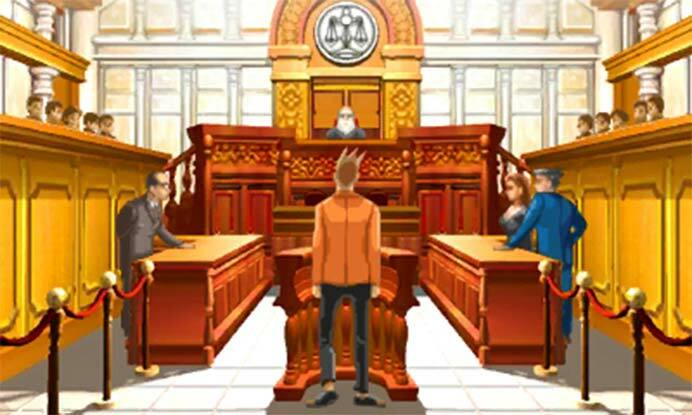 Clássicos na Nintendo DS e agora clássicos na 3DS, Ace Attorney: Phoenix Wright: Trilogy passa o teste do tempo e treze anos após o lançamento do título original, continua a ser uma das melhores experiências portáteis alguma vez feitas. Agora compilados numa versão que vale cada cêntimo, não há desculpa para quem nunca tocou num jogo do género. Если вы играли в Ace Attorney на DS, то велики шансы, что прошло достаточно времени для того, чтобы эти прохождения повторить — как пересмотреть отличный сериал. В конце концов, текстовые игры практически не стареют. Если же вы не знакомы с серией — сейчас самое время это исправить. Благодаря высокой интерактивности Ace Attorney ощущается куда живее визуальных новелл, а благодаря низкой сложности подойдет тем, кому не нравится ломать зубы о безумную логику классических адвенчур. Так что все, что вам нужно для получения удовольствия от Ace Attorney Trilogy, — это знание английского, готовность много читать и чувство юмора.